Home / Opinion / DDS Open Letter to Jesus Falcis on the alleged paid Dilawans: "Sino ba kasi nagbabayad? Proof ha, yung solid"
DDS Open Letter to Jesus Falcis on the alleged paid Dilawans: "Sino ba kasi nagbabayad? Proof ha, yung solid"
Social media personality, New York University alumna, and Duterte supporter Krizette Laureta Chu, once again fired a very clever yet brilliant thoughts regarding the very controversial tweet of Jesus Falcis, brother of Nicardo “Nicko” Falcis II, who is currently facing an alleged counts of qualified theft, after former business partner, actress Kris Aquino assertedly filed a criminal complaint against the latter. 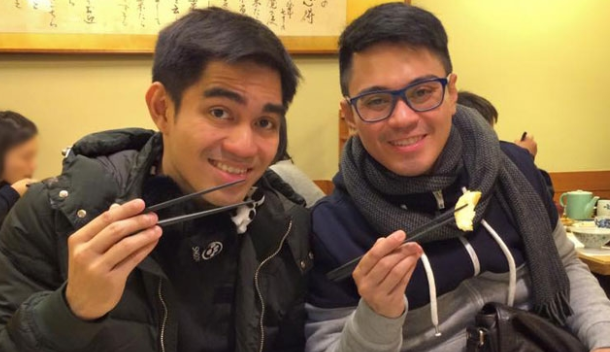 This battle of the Falcis brothers vs Kris Aquino is now taking word war in social media that even other bloggers from both opposition and administration sides, took their turns to actually know the truth, especially now that Jesus Falcis tweeted that there are allegedly 'Yellow' bloggers being paid for doing their job. Falcis even dared to name the paid bloggers and warned to show the receipts of the payments as proof of his allegations. 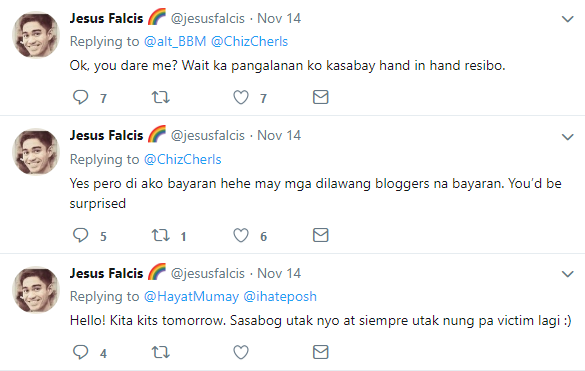 These tweets of Falcis, made DDS writer Krizette Laureta Chu so thrilled, that she challenged the latter to hand them the proof and name of the supposedly 'Dilawan' bloggers who get paid and by whom. 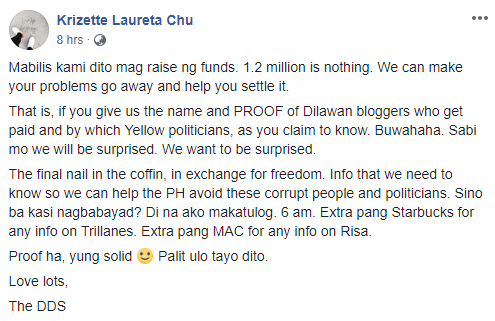 "That is, if you give us the name and PROOF of Dilawan bloggers who get paid and by which Yellow politicians, as you claim to know. Buwahaha. Sabi mo we will be surprised. We want to be surprised. ", Chu exclaimed. 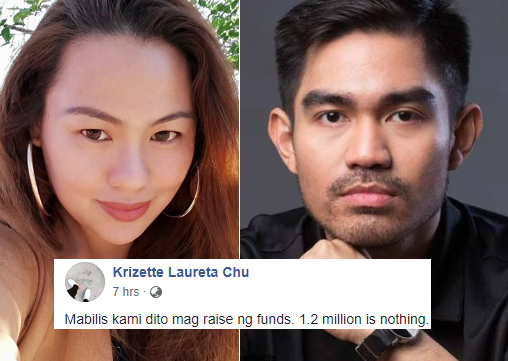 Krizette even teased Falcis that she and other DDS friends can assertedly raised funds to help him with the 1.2 million problem of his brother. "Mabilis kami dito mag raise ng funds. 1.2 million is nothing. We can make your problems go away and help you settle it. ", she joked. On a serious note, The NY University alumna earnestly said that they need the proof and information to actually help the country to maintain a strategic distance from those corrupt individuals and lawmakers. "Info that we need to know so we can help the PH avoid these corrupt people and politicians", she added. "Mabilis kami dito mag raise ng funds. 1.2 million is nothing. We can make your problems go away and help you settle it. That is, if you give us the name and PROOF of Dilawan bloggers who get paid and by which Yellow politicians, as you claim to know. Buwahaha. Sabi mo we will be surprised. We want to be surprised. The final nail in the coffin, in exchange for freedom. Info that we need to know so we can help the PH avoid these corrupt people and politicians. Sino ba kasi nagbabayad? Di na ako makatulog. 6 am. Extra pang Starbucks for any info on Trillanes. Extra pang MAC for any info on Risa. Proof ha, yung solid. Palit ulo tayo dito.